Congrats! I know your excited! Congrats! Super exciting! Also, I love love your dress!!!! Where is it from? Thanks, Laura! My dress is from Old Navy. It was on sale for under $15, and it's so comfy! CONGRATULATIONS!!!! Ahh!! I'm so excited and happy for you! Is it weird, but I had a feeling that you were, since you have been a little absent from the blogsphere recently. I love your cute dress. 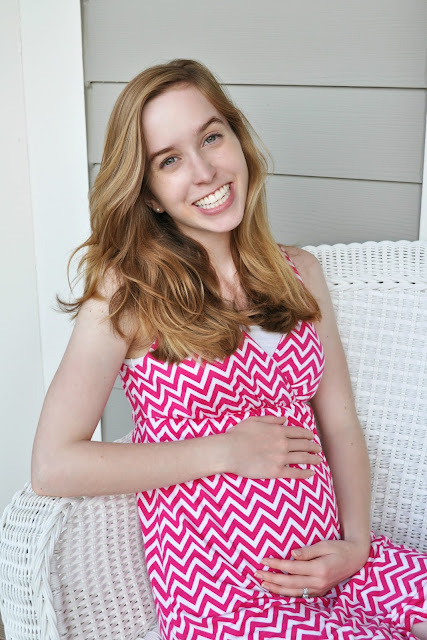 I also cannot wait to follow your pregnancy on your blog :) You will be such a cute mom! Congratulations!!! Welcome to your second trimester :) Hope you have a great pregnancy. Paula- thank you! :) I appreciate it! Leslie- Sometimes it's felt like the end of the first trimester was ages away! Thanks! Aw, yay! I am so, so excited for you! I can't wait to read more about your journey towards becoming a mom! You're going to be such a cute mommy! Laura- thank you, I'm looking forward to sharing this journey on the blog. Holly- thanks, I'm excited to share our baby story here! Found you through BlogHer. Congratulations! I am due in December as well! Yes, anytime! I love talking pregnancy/babies/etc :) Will we see you at Ben and Susie's wedding? I hope so! I can't wait to see that adorable baby bump! Susie- thank you so much, those prayers are more appreciated than you know! Victoria- small world! Congratulations to you too!